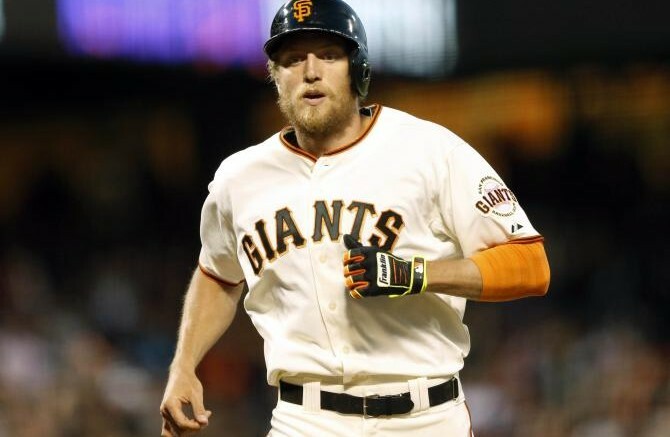 The Giants will be without the services of outfielder Hunter Pence for at least two months. The Red Sox look poised to start running away with the division early, but… not so fast. Like last year, the Blue Jays may be pacing themselves and, more importantly, might be a better team. The starting pitching has been stellar, better than anyone could have expected, even as the bullpen has been an adventure. There is no question they can hit home runs, although people have wondered whether that’s the only way they can produce offense. The Red Sox have come back to earth with a 4-7 stretch, and even with baseball’s most prolific offense, they have surrendered the third-most runs in the American League. That came to light in Baltimore when they were bombed for 25 runs over two days, including seven homers in one game by the Orioles, who aren’t going away, either. Baltimore is dealing with a few key injuries (O’Day, J.J. Hardy, Yovani Gallardo) yet continues to slug away. Mark Trumbo looks like an absolute steal, tying for the Major League lead with 18 home runs. The Yankees, at 26-30, may end up in sell mode, with Andrew Miller being dangled as bait for a team in need of bullpen help. And the Rays, though surprising with their 2016 power surge, aren’t in serious contention. Things change in a hurry, don’t they? The Royals are incredibly banged up right now, and the Indians took advantage during a convincing, four-game sweep at home. That vaults them into a 1.5-game lead in the division, and the White Sox continue to slide. They hope that changes with the trade for James Shields, but the truth is this team was overachieving big time in the early going. The Tigers are treading water and can only be considered a serious threat if they fix their awful bullpen. The Twins will have a say in the division race — that is, the team that can beat up on the worst team in the league the most in divisional play will likely take the crown. Speaking of convincing, weekend home sweeps, the Rangers took three straight from the road-warrior Mariners. Combined with the injury to King Felix, this is a critical time for Seattle. If the M’s can stay afloat, things will get better when he returns. But the Rangers are rolling, with the return of Yu Darvish and resurgence of Adrian Beltre, one of the few remaining 1990’s players. The Astros have caught fire, but like the Tigers have some bullpen woes to fix first. The Athletics were hot until Houston intervened, but Oakland is going nowhere. Neither are the Angels. Though this really is a two-team race between the Nationals and Mets, give the Marlins the nod for staying in the hunt without table-setter Dee Gordon. The tremendous return season from Jose Fernandez is front-and-center, helping mask a number of deficiencies the team has. The Phillies are finally back to earth, with their poor run-differential finally manifesting itself against good teams. The Braves aren’t worth mentioning. Speaking of big run differentials, you already know about the world-beating Cubs, but how about the Cardinals? Second-ranked in that department, St. Louis could seemingly catch fire at any moment. It helps that the Cards still have five series against the Reds and four against the Brewers, and that they finally won a series against a contending team in the Giants this weekend. The Pirates are headed in the wrong direction, though they too are proven to be a dangerous club when they are going right. With the Cubs in full control of the division, it will be interesting to see if both of these teams can grab a wild card spot. It is hard to envision both missing out. The Brewers and Reds, as doormats of the division, will have a chance to spoil things for the contenders along the way. But that’s their only glimmer of hope in 2016. The Giants will need to weather the storm with Pence out. They are still a very deep club, with their bullpen holding serve without stalwart Sergio Romo. The Dodgers would need a whole heck of a lot to go right to overtake San Francisco, but they have the resources to make a move to fix their beleaguered bullpen. The Rockies faded fast (surprise) and the Diamondbacks just don’t seem to have it together this year. The Padres are a flat-out disaster, as evidenced by blowing a 10-run lead in a span of two innings last week at home against the Mariners. Be the first to comment on "MLB Week 9 Roundup: Key Injuries in Play"